After a year in process, I finally recieve word from the Department of Justice regarding my contesting of the most recently obtained Freedom of Information Act request results. If you've been reading my main website or my blog then you are aware that I have been waiting for over a year to hear the results for my latest FOIPA appeal. I've been sending status requests for months now and each and every letter has been answered the same, "The request is still in backlog and will take a few more weeks to see too," etc. 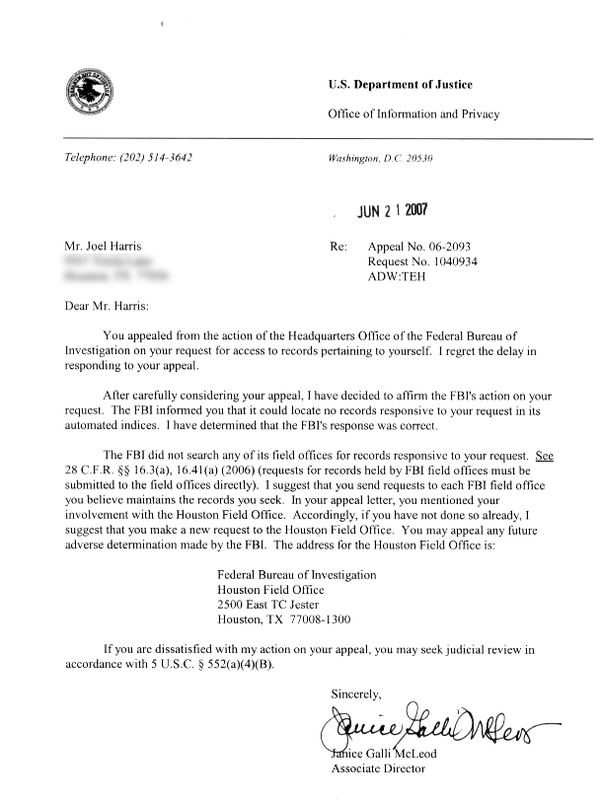 Well, as of June 26, 2007, the Department of Justice has officially decided to confirm the Federal Bureau of Investigations previous reply of 'null findings' to my most recent (well over a year ago) FOIPA request. Although I have made many FOIPA requests in the past and subsequent Administrative Appeals associated with them, this latest administrative appeal nonetheless is somewhat outstanding due to it's exceptional content. But first, before explaining why it's exceptional, a bit of personal FOIPA history is in order. As discussed in the legal/FOIPA section of jbhfile.com, early on in my attempts to gain data related to the investigation of myself, I would typically hand deliver my requests to the FBI's local Houston field office. This was a process I relished as it put me on a face to face level with the agency that I positively knew was a member of those agencies, both federal and local, that were active participants in the investigation. But unfortunately, this opportunity did not last long. On 09/12/03, after completing one full FOIPA/Appeal process, I hand deliver my *second* FOIPA request to the Houston field office but I am rather matter of factly informed that the local Houston field office no longer processes FOIPA's and all further correspondence must be carried out with FBI headquarters in Washington. This was a bit troubling at the time as it seriously impacted the time necessary to carry out such requests. "The FBI did not search any of it's field offices for records responsive to your request ... requests for records held by FBI field offices must be submitted to the field offices directly ... I suggest that you send requests to each FBI field office you believe maintains the records you seek." "I suggest that you make a new request to the Houston Field Office." Isn't that a bit ironic? I mean, the fact that the DOJ should use such language when the Houston local field office of the FBI told me directly in a person to person dialogue that I could no longer make requests for information from the Houston local field office? The unfortunate fact of the matter is that I retain no written statements from the Houston field office directing me to make all further requests directly to Washington; this was told to me via a direct verbal dialogue with Liz Norwood who, at the time, was overseeing FOIPA requests for the Houston FBI office. But the positive side of things is that it is some change in tack on the part of the FBI and it does equal progress of a sort if for no other reason than that. As mentioned above, this bit of dialogue from the DOJ, indicating that local field offices maintain records that are not necessarily made a part of the FBI headquarters main records database is actually a wonderfully effective means by which the FBI could, theoretically, refuse the provision of files from a requestor for an indefinite period of time. No matter the request, the associated files could always and quite conveniently be located at some other office other than the one the request was made to. One makes a request to the Houston office and: "Well, that week the files just so happened to have been sent to Dallas for some collaborative work and analysis." Make a request to Austin: "The files were never in the Austin office"
Make a request to FBI headquarters: "We don't maintain records associated with local regions and nor are the regional field offices required to make the records a part of our main indices. Sorry." So the fact of the matter is, obtaining records held by Federal agencies can be a daunting, time consuming and well-nigh impossible task if the agencies care to make it into such. Nevertheless, this is a process I will continue. I've spoken with too many others who made requests for years and finally were afforded the files they had been seeking to obtain.